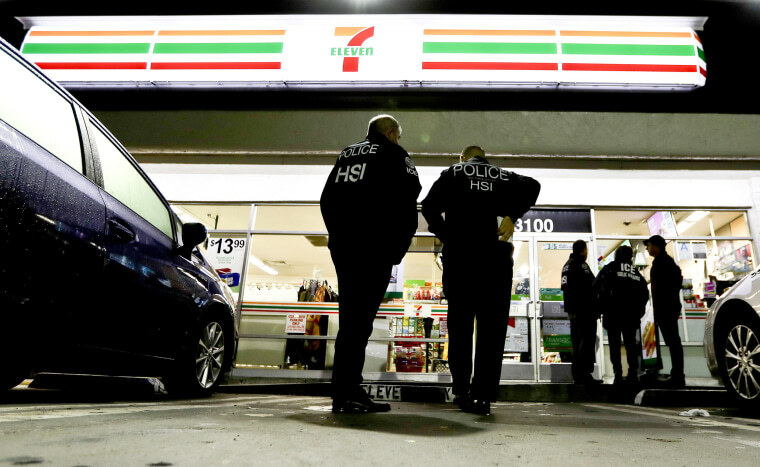 U.S. immigration agents raided dozens of 7-Eleven stores before dawn Wednesday and arrested 21 people in the biggest crackdown on a company suspected of hiring undocumented workers since President Donald Trump took office. Some 98 of the convenience stores nationwide — from Los Angeles to New York — were targeted by agents from Immigration and Customs Enforcement, whose top official described the raids as a warning to other companies that may have unauthorized employees on their payrolls. Homan did not say why ICE went after the Irving, Texas-based convenience store chain, which has 60,000 franchises worldwide and is famous for its Slurpee drinks. ICE hit stores in 17 states and Washington, D.C., and gave managers and franchise owners three days to provide the agency with the immigration status of their workers. Benner said they’re not just targeting big companies. “It’s going to be inclusive of everything that we see out there,” he said. “7-Eleven takes compliance with immigration laws seriously and has terminated the franchise agreements of franchisees convicted of violating these laws,” the statement read. Trump ran on a promise to crack down and deport undocumented workers. And under him, ICE has reportedly made nearly 40 percent more arrests. The raids on Wednesday grew out of a 2013 ICE investigation that resulted in charges against nine 7-Eleven franchisees and managers in New York and Virginia who allegedly used more than 25 stolen identities to employ over 100 people who were in the country illegally. Eight of the accused wound up pleading guilty and were ordered to pay more than $2.6 million in back wages. The ninth was arrested in November.